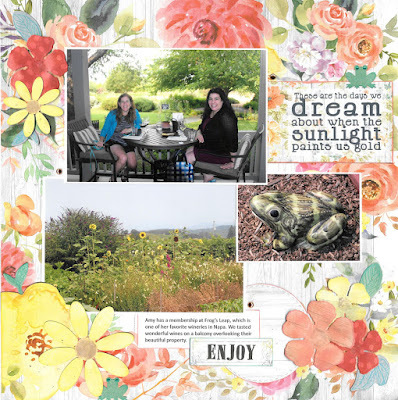 Blog Quick Quotes: Fields of Flowers with Louise! Fields of Flowers with Louise! Hello Quick Quotes readers! I hope you are all enjoying summer! Louise here with a layout about a summer outing I took with my sister. 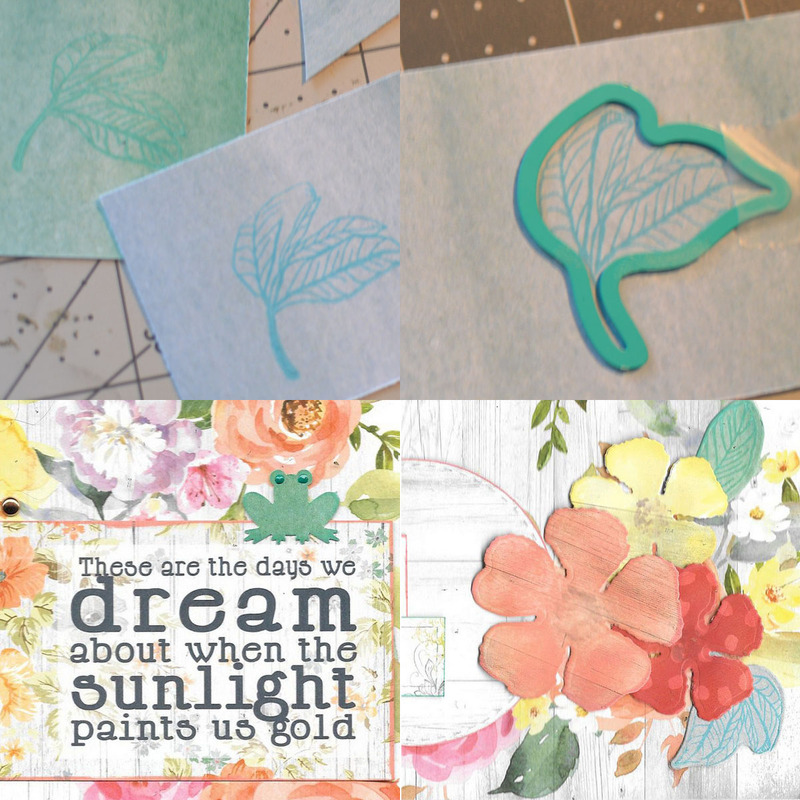 The yellow flower in the lower left is fussy cut from a sheet of the same patterned paper and inked with PowderPuff Chalk Ink in Buttercup. 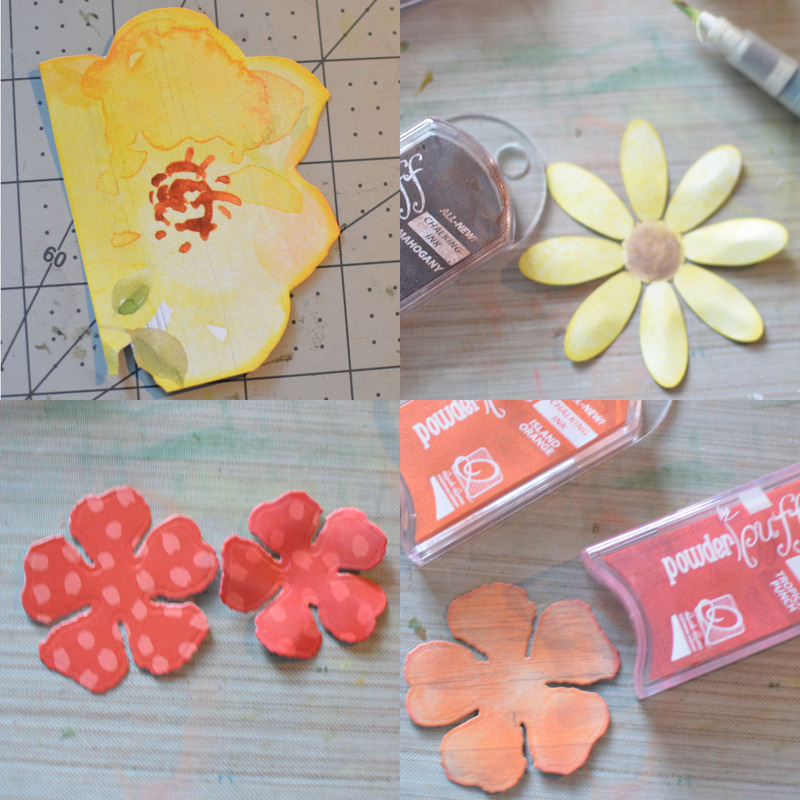 The paper flowers which look a bit like sunflowers were from my February Club Q kit. I used my ink blending tool to apply the Buttercup ink to the petals and my waterbrush to apply PowderPuff Chalk Ink in Mahogany to the centers. The other flowers were die-cut from the Spring Showers 102 and 104 papers. I used my ink blending tool to apply PowderPuff Chalk Ink in Island orange and Buttercup to create the orange and yellow ones. The red and orange ones are edged with PowderPuff Chalk ink in Tropical Punch. I shaped the flowers using my fingers. Since the background paper had both blue and green leaves, I decided to create additional leaves using stamps and dies with paper scraps from the same collection. The green ones were stamped with PowderPuff Chalk Ink in Key Largo and the blue ones with PowderPuff Chalk Ink in Bermuda. Since the name of the place had a frog in it, I punched a couple of frogs from the same paper scraps and inked them with PowderPuff Chalk Ink in Key Largo. I die-cut a circle from the Spring Showers 102 and placed it behind my journaling. After the page was assembled, I decided that the flowers needed centers so I carefully dotted centers using PowderPuff Chalk Ink in Mahogany and my water brush. To finish the page, I added some saying from the Farmhouse collection and placed 3 copper brads to create a visual triangle around my photos.